Did you know that there is probably a library near your house? It’s true. Wake County has 20 libraries! Click the map to find the one closest to you. The library is not just for books. Yes, the library has LOTS of books for you and your family, but it has so much more too! Wake County Public Libraries have computers with internet access and FREE events for adults, kids, and teenagers. You can take a music class, join a discussion group, hear stories, learn job skills, work on your resumé, and more! You can also volunteer at the library. Just fill out the application, and take it to your nearest library. Tell the librarian (person who works in the library) that you would like a library card. The librarian will ask you for your ID and proof of residency (something to show that you live) in Wake County. If you live in Wake County, your library card will be free. 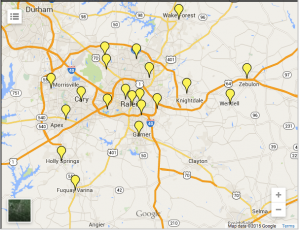 If you live in another county, you can get a Wake County library card for $25 per year. For more information, visit the library’s website. Do you have a library card? How often do you go to the library? Find one event that you would like to attend at the library. Ask your classmates to go with you! Civics and Culture, Community, For all students, Information and Resources, Reading. permalink.